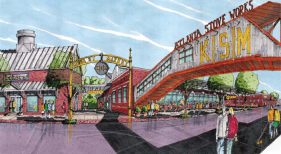 A cool new development is brewing in the former Tyler Perry soundstage. This new space will house local restaurants and a farmers market to hopefully help keep the corner of Lake Avenue and Krog Street alive. Let us help you accomplish your Real Estate goals in 2013! Great News for Atlanta Real Estate 2013 – Buy or Sell – NOW IS THE TIME! Call us for to help with your Real Estate Buying, Selling & Investing needs 404-808-1528.